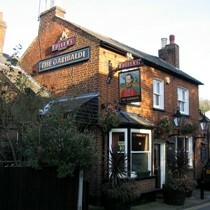 The Garibaldi in St Albans is a small traditional pub in a back street a couple of minutes walk from the main city centre. It is a Fullers pub that sells the full range of Fullers real ales - London Pride, ESB, Chiswick and Discovery. The pub dates back to Victorian times and gets its name from the famous Italian leader who visited England in the 19th Century. Majority of drinkers are middle-aged to elderly men. Seating for around thirty people mainly to the right and back. Don't tread on the dog! Welcoming friendly, quiet pub. Fine for a pint of good Fullers ale and a chat. Under new management. Now offering up to five real ales, mainly Fullers.